An estimated 1.7 million Australians have diabetes and 280 Australians develop diabetes every day, according to Diabetes Australia. It is the fastest growing chronic condition in Australia, with type 1 diabetes accounting for 10 per cent, type 2 diabetes accounting for 85 per cent, and gestational diabetes in pregnancy adding to the increasing number. Many people with diabetes have to watch what they eat, and measure glucose levels and ketone levels daily. But despite efforts to fight the condition, every six seconds a person dies from diabetes worldwide, a 2015 International Diabetes Federation (IDF) study indicates. On a global scale, an estimated 415 million adults had diabetes in 2015, the IDF study suggests. That’s one in 11 adults, with almost half remaining undiagnosed. By 2040, IDF estimates that one adult in 10 will have diabetes. Complications associated with this condition include blindness, amputation and death. 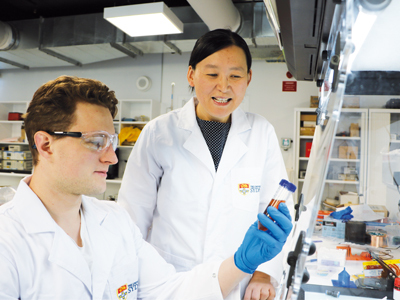 With the number of people with diabetes on the rise, University of Sydney professor, Xiaoke Yi, hopes a new device will alleviate some of the strain on millions of peoples’ lives. Yi and a team at Sydney University are developing a hand-held breath testing device that detects deadly ketones known as ketoacidosis. They expect the device will be available to people with diabetes around the world within two years. Diabetes Australia explains that ketoacidosis is a serious condition associated with illness or very high blood glucose levels. Most cases of ketoacidosis occur in people with type 1 diabetes. It develops gradually over hours or days and it is a sign of insufficient insulin. Without enough insulin, the body’s cells cannot use glucose for energy. To make up for this, the body begins to burn fat for energy instead. This leads to accumulation of dangerous chemical substances in the blood called ketones, which also appear in the urine, Diabetes Australia reports. The device measures ketones, which at elevated levels can be fatal. Yi hopes the device will help all people with diabetes that currently need to undertake finger prick blood tests, which can be a painful daily chore, according to her. The device would make the daily task of managing diabetes easier and it could help prevent deaths, she said. Yi’s grandmother died from diabetes and she’s heard cases from doctors of children with diabetes who had undetected ketoacidosis. The device could also be used for therapies using ketogenic diets which could help people dealing with ADHD, Alzheimer’s, Parkinson’s, some cancers, such as brain cancer, and other diseases, said Yi. The idea started from an undergraduate thesis project, in 2015. “At the beginning, we wanted to monitor air pollution, but when we started we thought this could help on the medical side,” said Yi. From there, the collaboration between the engineering department and the medical department started. It’s led by Yi, professor Stephen Twigg, from the Sydney Medical School, and associate professor Paul Williams, from the University of Sydney and Royal Prince Alfred Hospital. The device started as a prototype that was one-square-metre large and it continues to transform into something more usable. “We shrank it to half the size, then we shrank it to the size of two lunch boxes, and then we created a hand-held one,” said Yi. They have tested it as an airbag, but the goal is to have a smaller, more environmentally-friendly product that people can carry in a handbag or pocket. It may even be created into an attachment, which will relay information to a phone or watch, said Yi. Yi also mentioned that affordability, convenience, mobility and sustainability are key factors in finalising the product. Some users need to measure their ketone levels three times a day, so it needs to be easy to carry, she said. “If we do prepare it commercially and make it low cost, then everybody can afford it.” Once the prototype is finished, it will be tested on diabetes patients at two hospitals in Sydney. This is expected to happen at the end of 2018 or early next year. Yi explains that when the liver breaks down the fat it generates ketones. There are two parts to it – ketosis, which is good for the body, and ketoacidosis, which causes problems. “We target both, but the aim is to help the diabetes patients to prevent ketoacidosis because that can be life threatening.” People who want to lose weight, can benefit from a ketogenic diet, she said. “They can push their ketone level higher so they break down more fat.” It was recently discovered that a ketogenic diet can also help treat brain cancer, said Yi. Yi aims to create technologies for other biomarker measurements such as measuring glucose levels. “We would like to develop a non-invasive sensing technique for glucose monitoring in people with diabetes that is highly accurate, informs in real-time, low-cost, pain-free and risk-free. This will represent a major breakthrough in the development of non-invasive blood glucose measurement devices that can provide stable and reliable results, conveniently and economically,” she said. Diabetes Australia spokesperson Renza Scibilia said if there was a less invasive way to test glucose and ketone levels, it would be a welcome change by many people with diabetes. While some people use urine analysis, which can be inaccurate, most measurements are taken with by pricking a finger to draw blood. Often people need to administer insulin injections and do finger pick checks in public. While Diabetes Australia encourages people to do so freely in public, some people felt uncomfortable doing it or worried that they made others feel uncomfortable, said Scibilia. “Having something that’s not a needle might make them feel more comfortable. Diabetes Australia is always really supportive of evidence-based technology that is going to make it easier for people with diabetes day-to-day,” said Scibilia. Beyond health benefits, Yi is proud that she can contribute to a project that will create jobs in Australia. The technology is licensed by a Hong-Kong based company, Ausmed Global, which will be starting a subsidiary in Sydney in 2019. The prospect that people, such as university graduates, will get jobs out of this, tops it off, said Yi. “We have a team of young, intelligent students and research assistants. They are not afraid to jump out of their comfort zones.” With projects as challenging as this, they need to believe in themselves, she said. One of the students is Mitchell Austin, who is in the first year of his PhD, sponsored by Ausmed Global. Austin said it would help so many people, which made it a great project to be a part of. “Diabetes is getting worse as more people are getting it, so, the need for help is greater. I think of the number of individuals we will help with this project,” said Austin. Yi was the winner of the Excellence in Engineering award at the Women in Industry Awards 2018, held in Sydney in June.